There is always something new happening at the Museum of Discovery and Science. Spend a day of discovery exploring hundreds of interactive exhibits including an outdoor Science Park. Visitors can take a ride on the Everglades Airboat Adventure, experience hurricane force winds in the Storm Center, dig for fossils alongside a giant prehistoric megalodon, get close to a confrontation between a saber-toothed cat and an Imperial mammoth, and enjoy the playful antics of North American river otters in their two-story indoor/outdoor habitat. See exciting science demonstrations and presentations by community experts. Discover the amazing Everglades in the Florida EcoScapes exhibit. Hang out with bats, turtles and sharks. Meet an alligator and be charmed by a 6-foot-long snake. Take a ride to Mars or soar through the skies in an FA-18 cockpit simulator. And immerse yourself in a six-story-high film adventure at the AutoNation® IMAX 3D Theater, home of the BIGGEST screen in South Florida featuring IMAX with Laser. 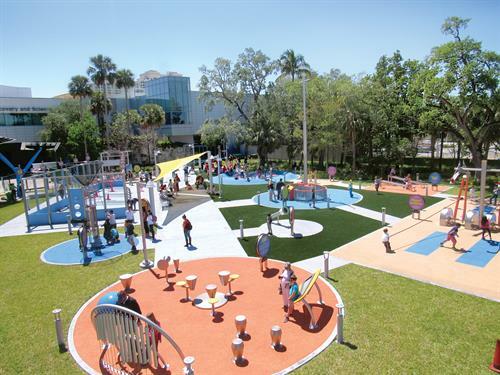 Whether you’re two or 82 visit the Museum of Discovery and Science and enjoy a full day of family fun. 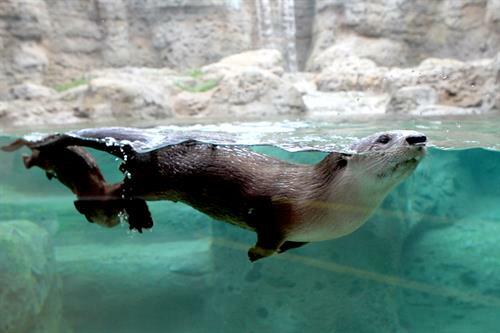 North American river otters live and play in their own two-story, indoor/outdoor habitat, complete with swimming pool and waterfall. The new Science Park exhibition provide multiple, content-rich opportunities in which visitors can experiment with basic principles of the physical world and come to intuitive understandings about how they work. 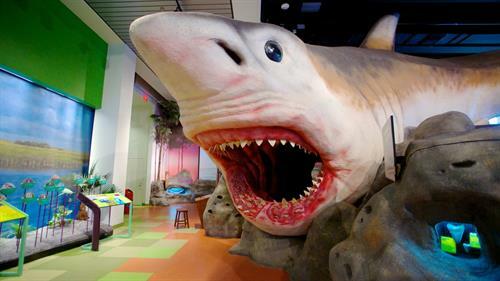 Step into the mouth of a giant megalodon, an extinct species of shark that lived many millions of years ago, and live to tell the tale. Go 65 million years back in time and get a new perspective on Florida’s prehistoric past and how it was shaped by climate change and changes in sea levels. 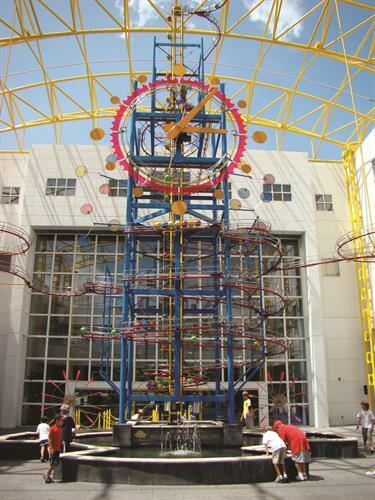 The Great Gravity Clock stands fifty-two feet tall and is the biggest kinetic energy sculpture in Florida. Located in the Museum’s Grand Atrium since 1993, this unique timepiece is one of the only three that exist in the world. Feel the rush of hurricane force winds in the hurricane simulator or view photos of the devastation left behind by Hurricane Andrew. Touch the vortex of a 10-foot tornado or generate a cloud or peer into a plasma sphere. The highlight of the TO FLY aviation exhibit is the state-of-the-art 7D capsule theater that will take students on an exhilarating flight through the sky using a 3D aviation film and multi-sensory experiences to create an unforgettable and educational experience.